At 11 p.m., Eva checked me again to find that I was 7 cm dilated. This was it: transition. We were on the homestretch. Eva asked if I wanted to get in the tub, and I couldn’t think of anything better. I got in the warm water right up to my neck, and this really surreal feeling came over me, like I was in a dream. The water was so warm and soothing, and as I stretched out in it and ran my hand over the surface of its calm, clear glassiness, I looked over at Will and asked him if maybe I was just dreaming…if maybe we were still at home in bed and I was still wishing labor would start? (Maybe I was getting a little loopy at this point?) The next contraction assured me that I wasn’t dreaming. Eva came in and suggested that I change positions, getting on my knees and draping my arms and head over the side of the tub. Getting into that position made labor take on a whole new level, with the contractions changing quickly and intensely. Will put on his bathing suit and got in the tub with me, leaning over me from behind to put pressure on my back. The next few hours are a bit of a blur for me, even now. I vomited about five times, and I’m pretty sure I was moaning pretty loudly at this point. Eva brought in a bowl of cold ice water with facecloths to drape over my neck and forehead. She suggested that I change positions again, leaning back in the tub again so she could check my cervix. In the middle of trying to change positions from my knees to a sitting/leaning back position, I kind of got stuck in the middle, on my hands and knees, unable to go any further because the contractions were so strong and fast. I remember clinging to the faucet for dear life and I think I may have been yelling things like “Help me, Will!” I felt a big pop and a gush (my water breaking), and tried to look behind me, expecting to see the tub full of blood or something, but at that point, I really couldn’t even get my eyes to focus anymore. It was like I was in some sort of dark tunnel all by myself, where I could hear Eva and Will saying things like “You’re doing great!”, but it was like I wasn’t even in the same room with them anymore. I heard Eva ask Will if he wanted to catch the baby and if he was prepared for the birth to start getting a little messy. I heard Will saying: “Whatever Dana wants… whatever Dana wants…” but I couldn’t even begin to put two words together at that point, so Will ended up standing in the tub somewhere between my head and my bottom, leaning this way and then that way, trying to help in every way he could. Eva finally got me to lean back in the tub and she checked my cervix, announcing: “10 centimeters!” It must have been after 2:30 a.m. at this point. Eva told me to start pushing whenever I felt pressure, but I couldn’t quite figure out how to do that. I couldn’t even get my mind around the idea of it, or what I needed to do to get my muscles to actually push. I remember screaming with the next contraction and hearing Eva say: “All of your energy is coming out of your throat right now, and you need to push with your bottom.” I couldn’t fathom what she meant, so I just screamed: “Get him out! Get him out! Can you get the baby out? !” The baby’s head was crowning at this point and I was feeling a lot of burning. Somehow I imagined that Eva could just reach in and pull him out and we could be done with the whole thing. Eva’s voice at the end of the tunnel was calm and clear when she said: “Only you can get the baby out. You just have to push.” That registered with me, and I started to push. Eva, Will, and Cricket were all yelling at this point, too. “One more push and he’s out! One more push and he’s out!” Finally, in one excruciating push, his head was out, but his body must have been a bit stuck, because I heard Eva’s voice sounding suddenly stern and insistent, commanding: “Dana, you need to push this baby out right now,” which scared me, so I put everything I had into one last, final, grunting, screaming push, and our baby was out and lying on my chest. The weight of our baby on my chest was indescribable—so warm and solid. I had been looking straight up to the ceiling while I was in my sitting/leaning/pushing position, and my neck felt so stuck in that position that I couldn’t even look down at the baby, so I felt him more than I actually saw him for the first couple minutes of his life. He felt beautiful. Eva, Will and Cricket quickly helped me out of the tub and onto the bed, where they bundled us up in blankets, checked out the baby on my chest, and delivered the placenta. Then, they left us alone to get to know each other for a while while they took care of cleaning up (Will said the tub looked like “a crime scene”), doing paperwork, and getting everything ready to head over to the hospital for our post-partum 48-hour stay. (I was more than happy to head to the hospital for that part of our birth!) Will and I just sat and looked at our Jack, who was chirping like a baby bird, as if he was singing to us. He reminded me so much of Julia and Charlie both, but in his own unique way, with his silky black hair and otherworldly grey eyes. He was just so much heavier, though. Cricket came back to foot print and weigh the baby, announcing: “10 pounds, 6 ounces!—We haven’t seen one this big in a long time.” Phew. No wonder why my belly was so big and heavy. Because of the baby’s size, they were required to test his blood sugar (hospital policy), which was low. Eva wanted me to nurse him—fast. (We found out later that it’s hospital policy to take the baby to the nursery to start formula immediately, and Eva was hoping that I could bring his blood sugar up by nursing first.) Eva helped me get into a wheel chair with the baby wrapped in my arms, while Will packed up our things. Eva wheeled us out into the cool night air, over to the hospital and up to the maternity floor, where the baby was immediately whisked away to the nursery. The nurses came back with the baby about 20 minutes later, shocked to find that his blood sugar was actually “excellent” when they tested it. They asked Eva suspiciously: “Did you give this baby dextrose over there?” and Eva smiled like the cat who ate the canary: “Noooo…we just let the mother nurse the baby.) Eva said the nurses were kind of flabbergasted by that, as if they’d never seen anything like it before. Will and I had a couple quiet days in the hospital to rest and bond with our baby before heading home. We had a “celebration dinner” on our last night in the hospital, which Jack kindly slept through while Will and I sat on the hospital bed together with a tray of fillet minion, lamb chops, wine, and chocolate cake between us, talking about the birth and our new baby boy. I’m sure it was the last quiet moment we’ll have together for the next 18 years. I’ve now had three weeks to process Jack’s birth. The feeling that I’ve walked away with is simply one of thanks. I’m so grateful that I was able to bring our baby into the world in a peaceful, gentle environment. I’m so glad that we were able to follow our birth plan—to a T. And I’m so thankful to have a healthy baby boy, above all. I’m also just so glad that I stuck to my guns and trusted my own instincts, even in the face of tremendous pressure to do otherwise. The entire experience has given me a new kind of confidence and belief in myself that I hope I can carry with me as I go forward to do the hardest labor of all: trying to be the best mother I can possibly be to our three beautiful children. 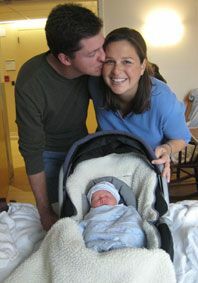 Join FitPregnancy.com’s Managing Editor Dana Rousmaniere each week as she blogs about her third pregnancy and her new baby boy.